For the past few weeks, I've been reviewing snack bars, in my never ending quest to find ones I like. I've tried all sorts of granola bars, including standard Quaker brand or fancy Awesome Bars. I've tried nut based bars, like last week's KIND bars. And occasionally, I even try protein, or nutrition focused bars. Those are usually even worse than the others. The offerings from LUNA all sound amazing, but I really do not like the flavors or textures. Probars are the best I've been able to find in this category so far. 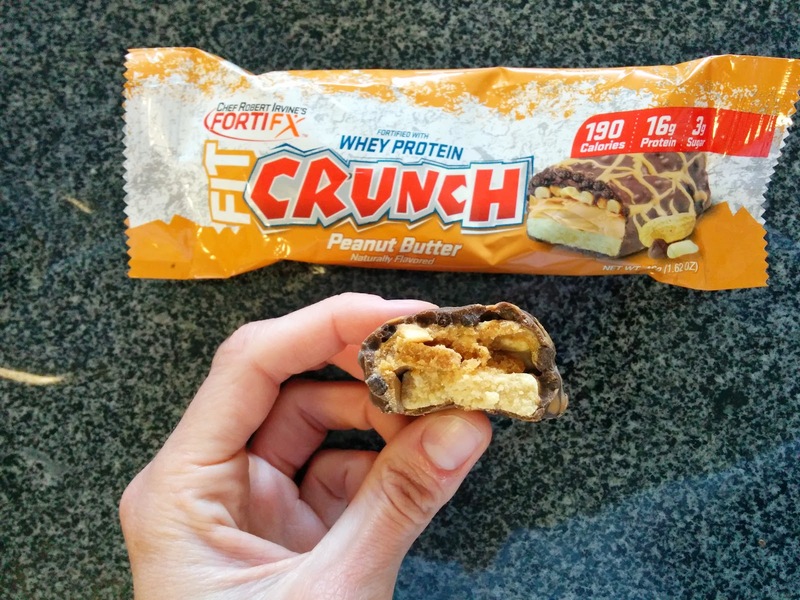 This week, I tried the FIT CRUNCH™ Baked Bars, described as, "The Ultimate Whey Protein Isolate Gourmet Bar". Yes, for real. I'm not sure how big of a market "Whey Protein Isolate Gourmet Bars" is, but these are apparently the ultimate. I almost really laughed out loud when I read their marketing. I laughed inside even more when I saw the box featured Chef Robert Irvine predominantly on front, bulging muscles fully flexed. You'll recognize him from several programs on Food Network. Protein bars are usually the biggest offenders in the snack bar market, with awful fake tastes from the substances used to keep the sugar content down, strange textures from whatever boosts up their protein levels, and quite often, they leave my stomach feeling queasy. You might ask why I even keep trying these things, when I tend to actually hate them, but ... if I could find one I like, it is really useful to have an easy high protein snack in your purse! So, back to our Ultimate Whey Protein Isolate Gourmet bars. What exactly are they? The bars have 6 layers, featuring a soft cookie layer, a creamy layer, and a crunchy layer. They are baked, which they say makes them more like homemade cookies rather than commercial bars, even though they have long shelf lives. They use whey protein isolate to provide 16g of protein per snack size bar, and even though they are chocolate coated, they have only 3g of sugar. This all sounds great, but many bars boost fantastic nutritional stats and taste awful. I don't care if it is good for me, if I don't want to actually eat it This is where Robert Irvine comes in, providing the tasty aspect. Or, so they claim. To say I was skeptical is an understatement. How many actually tasty protein bars have you had? The bars come in two sizes, snack size or meal size. The meal size are about twice the size of the snack size, providing 30g of protein compared to the 16g of the snack size. Unlike most brands with a large array of flavors, they make only two: peanut butter or cookies and cream. Here comes your spoiler: the one I tried was unexpectedly delicious. Not only was it better than any other protein bar I've tried, I actually felt like I was being treated to a candy bar. The textures were great (more on that below), the flavor wasn't bad, and I was honestly shocked. I only tried one of the two varieties, but if I encounter the other, I'll certainly try it out. And I'd gladly eat another of these, and I'd enjoy it more than a Snickers bar. 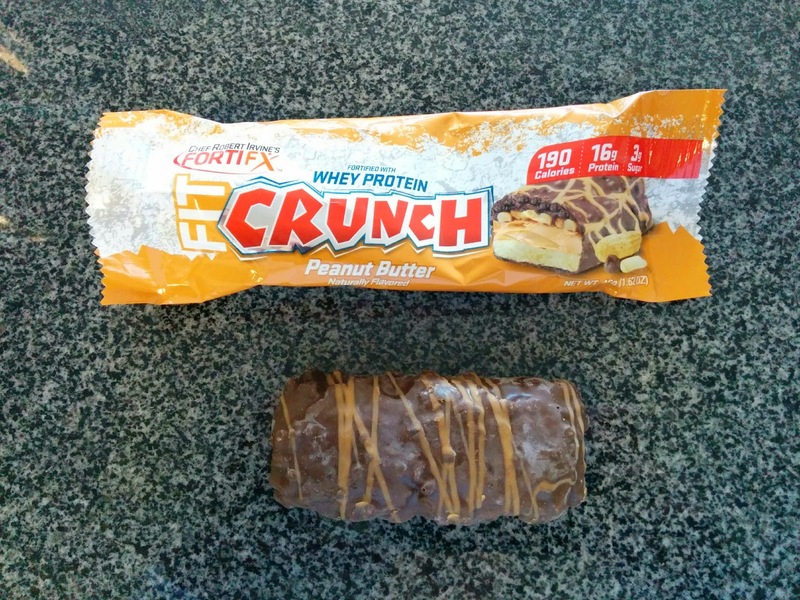 Peanut Butter Whey Protein Fit Crunch Bar. My skepticism continued as I opened my bar. The wrapper was twice as long as the bar. I felt a bit cheated, but this was the smaller snack size, and it was big enough. Described as "a vanilla cookie core layered with peanut butter, fresh peanuts, high protein chocolate, chocolate crisps and top-layered with a creamy chocolate and peanut butter drizzle." Just as described, the bar was covered in milk chocolate, a thin layer, and drizzled with the peanut butter drizzle. I couldn't really taste the drizzle, but it made it pretty. Peanut Butter Whey Protein Fit Crunch Bar: Inside. I broke the bar in half to reveal the contents. I wanted to find all 6 layers! I think they count the peanut butter drizzle and the chocolate each as a layer. The base was what they consider the vanilla cookie core, I'm assuming it is where all the whey protein was. I expected it to be chalky and gross like all other protein bars, but instead, it was a bit chewy, indeed soft, and not gross. I wouldn't call it a fresh baked cookie, but, it worked. On top of that was a similarly thick layer of peanut butter cream. It was creamy, tasted like, well, peanut butter, and complimented the chewier cookie layer. On top of that was chunks of peanuts, which added a bit of crunch, and more peanut flavor. The final layer, right under the chocolate, was a thin layer of chocolate crunchies, which provided even more crunch. This bar got a lot right. First, chocolate and peanut butter, clearly a delicious combination. But with so many of these bars, they taste fake, or the protein compounds mask the other flavors. That didn't happen here. You could really taste the peanut butter in particular. They say it was "made with the PB connoisseur in mind", and, it shows. The textures were also right, another area where protein bars usually fall down. You had soft, chewy cookie, creamy peanut butter, and crunchy nuts and crispies. It really was enjoyable, honestly, just like a candy bar. But one you don't need to feel remotely guilty about eating. A winner. Last time I reviewed Phat Philly, it was for their delicious cheddar beer fries. You'd think that this time, I'd actually review their signature item, the cheesesteak? But, you'd be wrong. I went back, but this time, to try their other fried side dish: onion rings! I'm really not sure why, but I've been craving onion rings. And since I was impressed with their fries, I decided to give the rings a chance. Since I've reviewed Phat Philly before, I won't go into the details much, except to again call out the very friendly staff. The menu listed the onion rings as coming with either ranch or bbq sauce, and I was unsure of which I wanted, and didn't specify either when I ordered. The woman taking my order said, "with ranch?" And I replied, "I'm not sure! Is that the one you'd recommend?" She smiled, and just said she'd give me both. Yay! No decision required. I also took advantage of the beautiful sunny day and choose to sit at one of their cute picnic tables on the sidewalk, rather than inside. I was a bit wary of this in the past, as the location is right on 24th between Mission and Valencia, not exactly sidewalk territory that you want to hang out on. But it was so sunny! My suspicions about it being a less-than-stellar choice were confirmed within seconds of sitting down. I was quickly joined by a woman who kept calling me "sister", and started asking me for all sorts of things. Once my food arrived, I shared a few rings with her, and she went on her way. But, just something to keep in mind if you want to enjoy the outside seating at Phat Philly. Beer Battered Onion Rings, Ranch, BBQ. $4.50. The onion rings, just like my fries on my first visit, were made to order. I heard the cook immediate drop them into the fryer after I ordered, and appreciated the sound of the sizzling oil. I was really looking forward to these! The rings were obviously fresh. The breading wasn't too thick, it was oily, but not in a gross way. It was very crispy. I didn't taste the beer in the batter, which I didn't mind, as I don't actually like beer. The rings came in a variety of diameters, although were uniform in their width. I like having contrasting thin and think ones, since the thick ones can have a much stronger onion flavor, while the thin ones are usually crispier. But anyway. The BBQ sauce was thin style, pretty standard, and just not remarkable. It wasn't bad, but it didn't really add much to the rings. The ranch on the other hand was clearly the winning choice. It had a bit of tang, lots of herbs. Better than your average ranch. Cooling and creamy. Yes, it is a little gross to dip deep fried oil soaked things into ranch but ... come on, sometimes, you gotta live it up. And live it up I did. Near the end, I started combining the bbq and the ranch, and that was even better, a bit zesty. I could imagine adding any of their slew of hot sauces to the ranch to amp it up as well. I'm glad I was able to sample both sauces, as I was leaning towards BBQ if I had to pick just one. 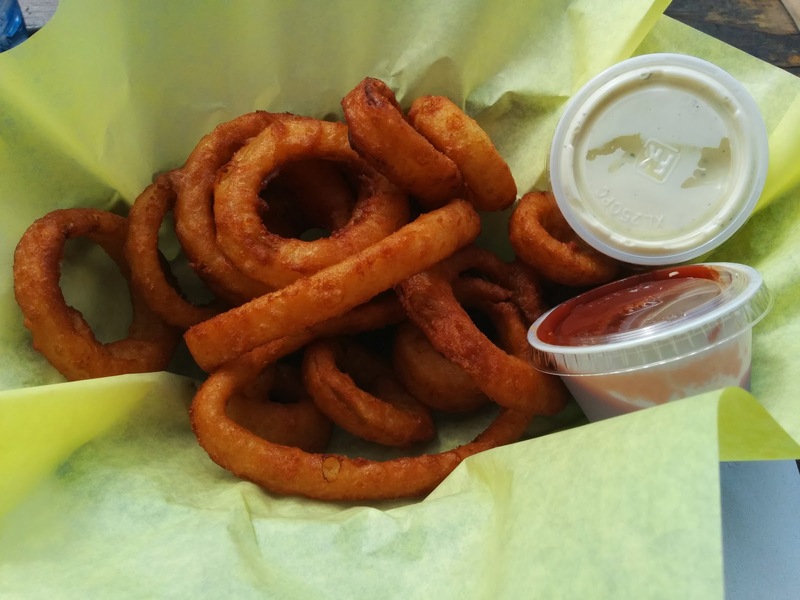 Unlike the fries, the rings come in only one size, $4.50 for a basket. This was a fine price, and a generous serving. Probably more appropriate to share with someone with a cheesesteak, or, if you are like me and just craving some fried food, a perfectly acceptable large-ish snack alone. I enjoyed my onion rings, but I wouldn't call them the sort of thing you have to seek out. If you are in the mood for rings, by all means, get them, but I'd pick the cheddar beer fries over the rings. I'm going backwards just a bit in time here, back to November, when I had to fly from Boston to San Francisco, after a recruiting trip. I managed to actually find a decently priced flight on American Airlines, First Class, if I was willing to stop in Dallas on the way. I normally always just fly direct on JetBlue or Virgin America, economy class, but the flight times weren't great, and I wanted to experiment with the tradeoff of a layover. My flight was broken into two segments, Boston to Dallas, then Dallas to San Francisco. My second flight did get slightly delayed, but otherwise, I was happy with my choice. My seats were much larger than I would have had in economy class on the other airlines obviously, and although the connection did increase the total travel time, the onboard experience was so nice that I didn't mind. I had wifi on both segments, and the flight attendants took great care of me. Overall, quite pleasant! Since this blog is about food, rather than in-flight services however, I'll focus on that instead :) The first flight was lunch service, which was fairly limited: a choice of a cold salad or a single hot entree, and cookies for dessert. And the food on that flight was really mediocre. But the next flight was a full dinner service: appetizer, choice of hot entrees (which I could reserve online before the flight), side salad, hot rolls, and ice cream! It was certainly the best dinner I've had on a domestic flight, and even better than some of the business class meals I've had internationally. It put Virgin America's first class dinner service to shame. I remember being really impressed the first time I flew business or first class on American. They served warm nuts! This was incredible novel to me. However, on both legs of my trip this time around, the nuts were barely lukewarm. I was in the very front on the first leg, and the back on the second, and it didn't seem to make a difference. Disappointing. 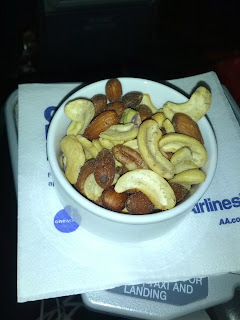 The nut mix consisted of mostly almonds and cashews. My first batch also had one pistachio, my second had two. My second batch also had two broken chunks of pecans. Clearly, they know the cost of different nuts. The nuts were lightly salted, but otherwise, completely flavorless and unremarkable. I guess the novelty of nuts other than packaged peanuts has worn off. The salad was described as "fresh greens with Buffalo chicken, blue cheese, carrots, celery, cucumbers and ranch dressing". It also came with a roll and a pat of butter on the side. The roll was better than I expected, a swirl rye roll, with plentiful caraway seeds. Not a nice fresh roll or anything, but served warm, and actually had some flavor. The butter was just butter. The salad on the other hand was pretty bad. The "fresh greens" did consist of a good mix of assorted greens, including baby spinach, romaine, even a few pieces of frisee. But they were not remotely fresh and crisp, but rather limp and turning brown around the edges. Even bagged salad is better than this. As for the rest of the vegetables, the carrots were standard carrot shreds, flavorless, but a bit crispy at least. The celery was small chunks, old looking, turning white around the edges. Like the lettuce, clearly not fresh. Really not good at all. The blue cheese came in a few crumbles throughout, again, pretty flavorless. How do they make blue cheese flavorless? The ranch dressing was basic ranch. Actually not offensive, served on the side. As for the chicken ... it was coated in a fairly decent buffalo sauce. It had some kick. I managed to salvage a meal from the wimpy lettuce, with some spicy buffalo sauce scraped off the chicken, with ranch and carrots, but I wasn't very happy. 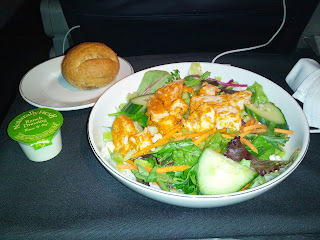 It made me again think about how absolutely amazing Virgin America's salads, like the tuna niçoise or arugula and roasted pear, have been, and those are just in Main Cabin! Each time I've had them, I've been very impressed with the freshness and quality. The other chicken option was a far more substantial meal - they had the same roll we did, but then a side salad, a full piece of chicken, and sides of potatoes and corn. Not that I wanted that dish, but it seemed like the better "value", if you were going for that kind of thing. After my meal, I wanted a coffee. When I ordered it decaf, the server actually warned me that it was a powder. Nescafé. I still tried it. It was fairly awful, but better than the instant Taster's Choice provided on Virgin America. I will never take fresh brewed, even mediocre, decaf for granted again! I appreciated it paired with my dessert, but otherwise, yeah, not good. It made me desperately wish that I'd filled my travel mug with Dunkin' Donuts while still inside the airport. Self-protip for next time! 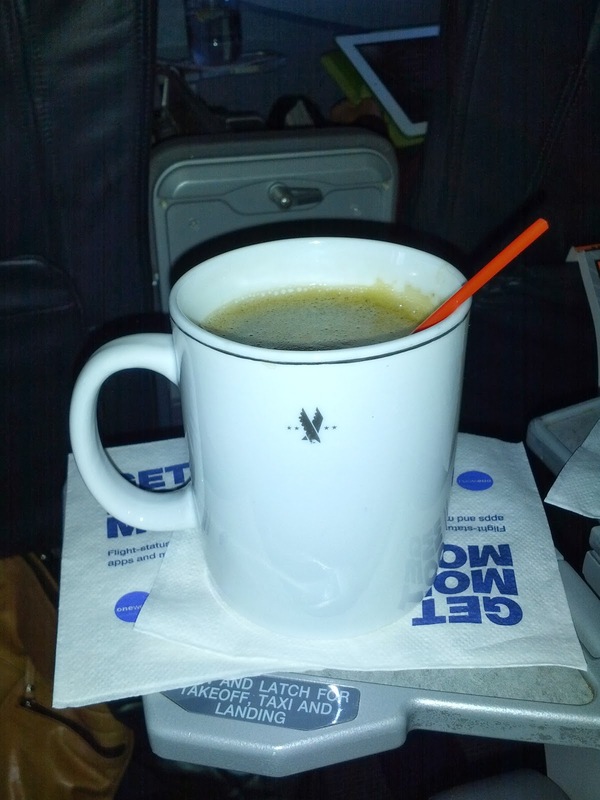 The first time I flew first class on American Airlines, I couldn't believe that they served warm cookies. My mind was blown. Even more amazing than warm nuts! Obviously, cookies are always better when warm, but the real selling point was the aroma of the freshly baked cookies drifting through the cabin. OMG. So memorable. 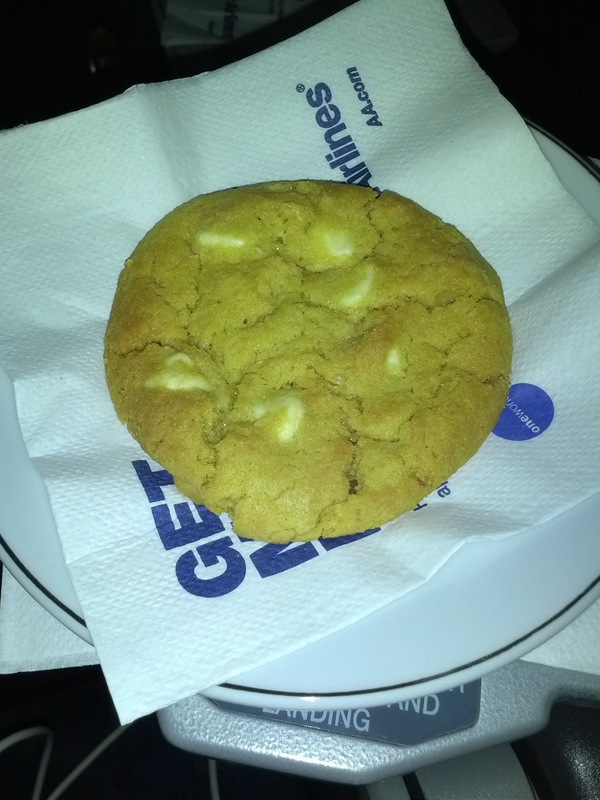 I was thus of course delighted when I started to smell the cookies baking on this flight. I knew good things were coming. We had the choice of standard chocolate chip or white chocolate chip. I decided to go for the white chocolate, as there was only one chocolate chip left, and it was clear the woman next to me really wanted it. It was a good enough cookie. Sweet and buttery. A bit plain, since just white chocolate chips aren't that interesting. But, it was soft and warm and fresh. Are they the best cookies out there? Of course not. But they are hot! They are soft! I was happy. Shrimp cocktail, side salad, wheat roll, butternut squash gnocchi with sage cream sauce. My next flight featured dinner service, rather than lunch. The lunch meals seemed pretty wimpy to me, so I was happy to see that dinner was a much more substantial offering. It was served all at once, but included an appetizer, salad, roll, and entree (well, and dessert, but that came later ...). The appetizer was a simple shrimp cocktail, consisting of 4 shrimp, along with cocktail sauce and a wedge of lemon. The shrimp weren't great, fairly limp, but they weren't rubbery, and they were cleaned properly. The lemon wedge was very juicy, easy to squeeze over my shrimp. The cocktail sauce fairly standard, I'd love it to have a bit more kick from some horseradish, but it wasn't bad. Overall, this was fairly lackluster, but not bad exactly. The side salad was strange. It consisted of romaine lettuce and ... rice. I get that the rice was there for some crunch perhaps, but I really didn't care for it at all. The lettuce was about as unremarkable as in my lunch salad, although this time it was only romaine. But, the real issue with the salad was the dressing, an italian vinaigrette, poured on my the flight attendant. And by poured on, I really mean poured on. She way, way, way over dressed this. I couldn't really eat it. I preferred the lunch option, as it had the dressing on the side at least. For rolls, we had a choice of white or whole wheat topped with oatmeal. I went for whole wheat. Again, like lunch, they were served warm, and really weren't bad. Not good fresh rolls, but not bad. I didn't really want it on its own, but dunked in the sauce from the gnocchi, I enjoyed it. And speaking of that sauce. Now for the star of the meal: the gnocchi. The dish sounded great: "butternut squash gnocchi with sage cream sauce". When I made my flight reservation, I was able to select my entree, and was delighted to see this option (the other choice was of course chicken, with risotto and spinach). If I'd been out at any restaurant, I would have been very excited for this. Gnocchi! Squash! Cream Sauce! But, I was on a plane, and I knew it. So, I didn't have any real expectations. In fact, I didn't really think I'd eat much of it. I had a bag of snacks with me in case. When I saw the gnocchi, I still had no expectations. The sauce wasn't really evenly covering the gnocchi. The sauce looked like it was swimming in oil. I was a bit sad, but still dug in. To my delight, looks can be deceiving. The dish was good. Legitimately good. Not just acceptable for being on an airplane, but actually good. In particular, it was incredibly flavorful. First, the gnocchi itself. Large, fluffy, potato pillows, that were actually stuffed with pureed butternut squash as well. I was not expecting the filling at all, I thought they were plain gnocchi, and that the squash was only the chunks also in the dish. The flavor of the filling was wonderful, slightly spiced. The texture of the gnocchi was good, soft potato outside, creamy filling. Sure, I do like freshly pan seared gnocchi more, but this was very good for something on a plane. The sauce, although it was oily, was also quite good. A cream sauce, with plentiful sage to season it. Just like the gnocchi filling, I was impressed with the seasoning. The only component I didn't like were the chunks of squash. Most were very overcooked, and just mushy. Others were really stringy. I love butternut squash, so kept trying more chunks, but eventually I gave up, as they were just not good, and were easily avoided. There were enough other delicious parts to enjoy anyway. This dish just screamed, "I'm a fall dish!" It reminded me of all of my favorite parts of a Thanksgiving dinner, in one package. See, I actually don't like turkey, at all. So for me, Thanksgiving is all about mashed potatoes, squash, gravy, and stuffing. And, I basically had that here. The potato gnocchi was like mashed potatoes, the creamy sauce was like gravy, and the roll, which I didn't think was awesome on its own, was perfect for dunking into the sauce, like stuffing with gravy. Maybe I'm stretching here, but that is really what it reminded me of! So, I liked this. It was good enough that I was sad when it was all gone, which shocked me, because originally the portion size looked quite large, as I'd just been chowing down on assorted snack mixes in the Admiral's Club, and my previous flight had served a late second lunch. And I shocked myself further when I ate the entire roll, just as an excuse to keep soaking up the sauce. Well done American Airlines! 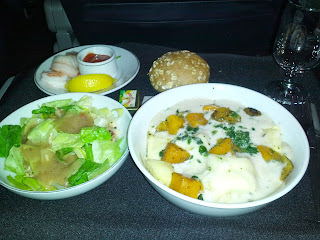 Side note: A month later, at Christmastime, I had a similar sounding entree when flying first class on Virgin America. It was not good. So no, it isn't just the case that pasta dishes with squash always come out well on flights! Vanilla ice cream with almond streusel. After the decent dinner, I was pretty happy. But of course, there was one thing I was REALLY looking forward to ... dessert! I recalled one of my earliest American Airlines first class flights, from SFO to JFK. 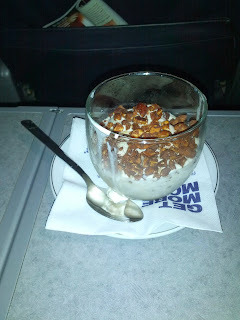 On that flight, the dinner service concluded with ice cream sundaes. With Ben & Jerry's ice cream, no less. And, it was a sundae cart, with assorted toppings, including hot fudge and whipped cream. Made to order. I had never flown first class before, and that was my introduction to it. I couldn't believe it. I loved it. So this time, I was a bit sad to see that there wasn't an ice cream cart. I guess the sundaes are just on the longer flights? But I was still given an ice cream option (or, a very sad looking fruit and crackers platter). I obviously picked the ice cream. I was eager to dig into my ice cream, but alas, it was frozen so solid that it would take a while before I could possibly even get a spoon into it. I kept trying every few minutes, and at first, I thought it wasn't very good. Just plain generic vanilla ice cream, topped with some rather burnt almonds. No options for other toppings. Sadness. This was nothing like the ice cream sundae I remembered! But, as it melted, it got much better. Creamy. With nice crunchy nuts. But of course, I had to jazz it up a bit. As my after dinner drink, I ordered cognac. It was nice to sip the cognac, and then take a bite of ice cream, but somewhere along the way, I decided to pour a little over my ice cream. I loved it that way! Now my ice cream was boozy, which paired really well with the nuts. This turned out to be a very satisfying, successful meal, something I never expected on my flight! Fuzio is a restaurant located not far from my house, in Embarcadero Center. But, I haven't actually dined at the restaurant. If I had, you'd be reading this review on a Wednesday, rather than on Monday, catering review day! I attended an event, held at Embarcadero Center, which Fuzio catered. Ideal for them, as they didn't have far to go with the food, but from their web site, it appears that Fuzio does normally do catering too. They also have a second location in Modesto. So what is Fuzio? Well, their full name is "Fuzio Universal Bistro", and, from reading their website and menu, they truly are trying to be universal! They claim to mix fine dining and casual. Yelp lists them as featuring Italian and Asian Fusion cuisine. And the menu? All over the place. American dishes like burgers and sandwiches are listed alongside Italian pastas, pizzas, and chicken parmesan, plus fish & chips for the pub goers, Mediteranean style grilled salmon, soups, and salads for the health conscious, and a bunch of Asian inspired appetizers. I guess, a little something for everyone? I find it hard believe that they could possibly do all of this well. But, as I haven't been to the real restaurant, I'll withhold judgement. They had a few different items to offer, but, being a lover of sweet chili sauce, I was immediately drawn to the spring rolls: "soft rice paper, vegetables, cilantro, mint, grilled chicken, ginger-carrot salad and sweet chili sauce". The spring roll had fallen apart before I even touched it, which I'll blame the catering aspect of their offering on. Hopefully when served at the restaurant, this does not happen? I guess "soft rice paper" really did mean SOFT though. 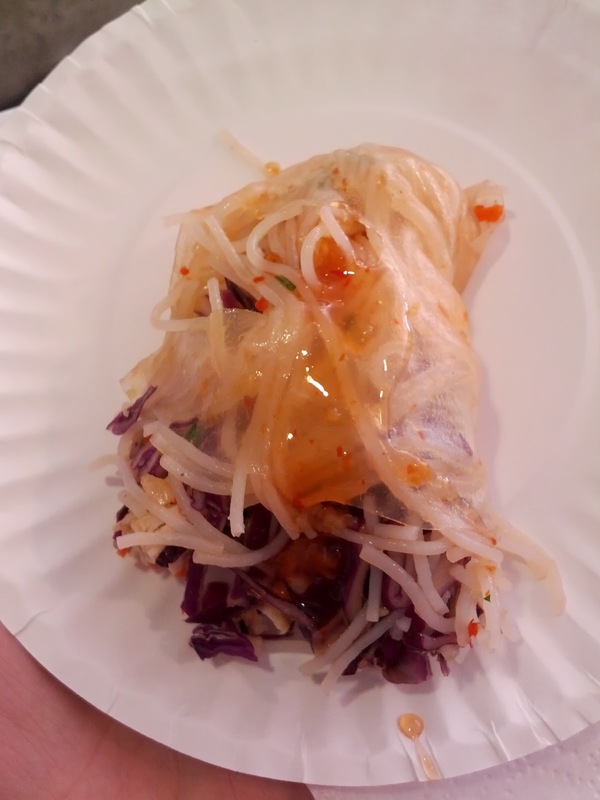 The filling was primarily vermicelli noodles, which is interesting, given that they weren't listed as an ingredient (although a standard for spring rolls obviously). The noodles overwhelmed everything else. I'm always grumpy when rolls have the balance of mix of ingredients so off like this. There was plenty of crispy cabbage, which I guess counts as the "vegetables" in the description, but nothing else. I didn't actually have the chicken, since I dislike chicken, and just picked it out. Overall, I mostly just tasted vermicelli noodles, and I was unimpressed. The sweet chili sauce was tasty though, pretty much exactly what you'd expect, but, a messy pile of noodles with sweet chili sauce isn't exactly a recommendation. Monique's is a chocolate shop located nearby in Palo Alto. I haven't been there myself, but I recently had the opportunity to try their truffles. I had never heard of Monique's myself, but a friend was on a quest. He had a major task at hand: he wanted to come up with a thank you present for our mutual friend Emil. Now, you've probably heard me mention Emil many times in the past. He is an incredibly generous man. He is also a man of incredibly discerning taste. This makes him a bit difficult to find gifts for. For example, we know that he loves wine, he loves champagne, he loves fine spirits. An easy gift right? No, because we also know that we'd never pick anything as good as he would choose himself. And just buying the thing we last saw him drink is no fun. So we kept brainstorming. Rather than focusing on what he likes, we moved on to what he dislikes. He hates sweets. I don't mean that he just doesn't enjoy sweets as much as others, but, he legitimately does not like sweet things. Quite literally, the only chocolate he will eat is 100%. But, he likes good 100% chocolate. If you have read my past chocolate reviews, you have likely noticed that I have actually often reviewed high percentage bars, always because they were ones that Emil found and brought in for tastings. Since our friend was on a quest to come up with a good gift for Emil, and I mentioned that Emil likes 100% chocolate, our friend took it upon himself to find a very special 100% chocolate. Finding 100%, or even 99% chocolate, is always a bit difficult, as most people do not choose it. But our friend did better than just finding 100% chocolate, he found 100% truffles! None of us were even aware that truffles are made with that high of cocoa content, the only 100% we'd ever found before was in bar form. But, Monique's makes multiple 100% truffles! We dug in apprehensively, as even most 100% bars turn out gritty (or otherwise are just not very good). Monique's was a pleasant surprise. So, if you have a 100% chocolate lover in your life, check them out! French Barry Blend (100%), San Francisco Tcho (99%). This box was filled with several types of truffles, along with a handy guide to the truffles (each uniquely identified by their paint job), but I waited too long to snap a photo, as others had already grabbed their picks. Whoops! 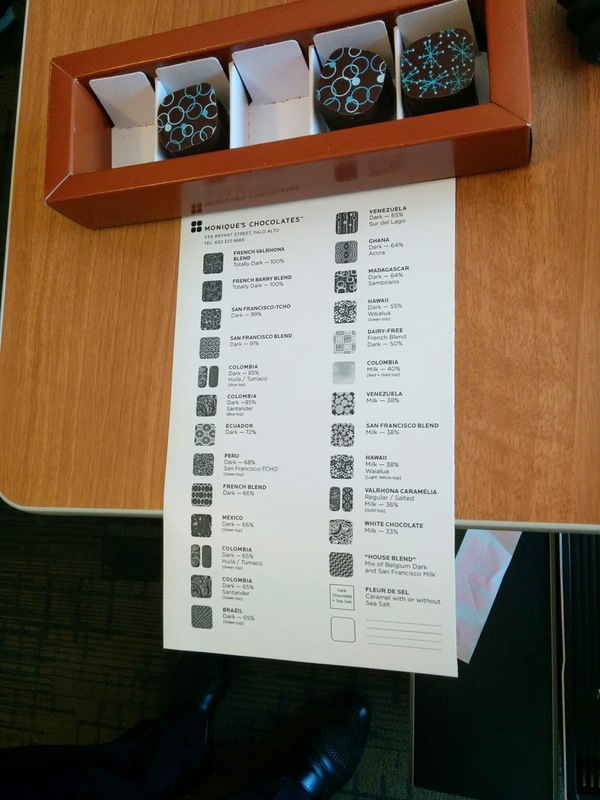 The presentation was nice, the truffles each separated from each other in the box. The aforementioned paint jobs were also pretty, all in the same color scheme, but totally different designs. The truffles were all a very large size, a bit hard to tell from the photo, as it was the depth was really the impressive part. These were not one-bite creations. They almost seemed like too much. Emil went for the 100% and the 99%, obviously, and enjoyed them both. We were all shocked that Emil had finally found a truffle he likes. I think he was shocked too. He kept remarking about how smooth the chocolate was, so rare for 100%. Victory! I tried the San Francisco Blend (91%), not pictured here because I devoured it before I took the photo. It was far darker than most truffles I am used to, or even more than most chocolate for that matter. Definitely more bitter than I am accustomed to, but it was so smooth and creamy that I didn't really notice. Due to the large size, and the high cocoa content, it left me a bit jazzed after, which was also kinda fun. I would love to try some of Monique's other chocolates, because if they can make super dark chocolate this good, I'm very curious to see what they do with a more mild chocolate.